Swim Bike Run: Did I bite off more than I can chew? Well here it is, officially the end of March is around the corner and the beginning of Spring is here though the weather outside and the forecast would have you thinking it was still deep in February. Does that look like Spring to you? I haven't been myself lately and I can list off a million and one excuses why. I pushed too hard at the Ft. Lauderdale Half Marathon and I had to take 2 weeks off to recover, then I had my trip to NYC with my daughter coming up and then I got a head cold right before leaving for NYC ... in any case, my training schedule was basically non-existent and definitely very little consistency if any! Not to mention this winter and the Polar Vortex! And then it sort of hit me - did I bite off too much this year? Is shifting from end of year Ironman to a mid-season Ironman not giving my body (and mind) enough distance from Ironman training? Did I really think I could sandwich an Ironman in between the Boston and the NYC Marathons? How in the heck did I get here anyway?????? But I am here - and I've got entry to and paid for both Boston and NYC - both of which I may never get the opportunity to run again. Then there is Ironman Lake Placid - my "validation" Ironman. 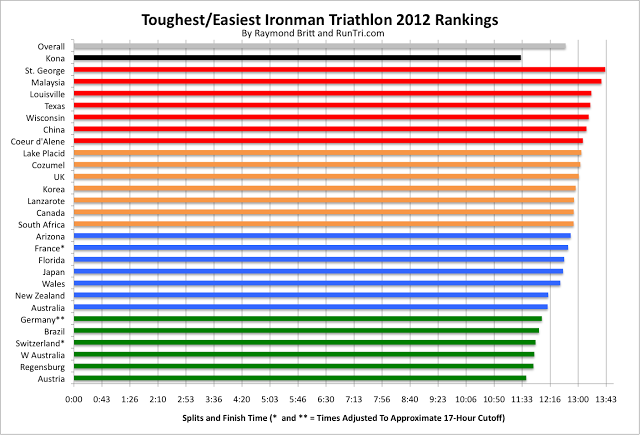 What's a validation Ironman you ask? As you know I have done two Ironmans - Ironman Florida 2012 and Ironman Cozumel 2013. Both of these course are flat and considered "easy". Well, let's just be clear - there is no such thing an an easy way to propel your body 140.6 miles. If you take a look at this guy's number crunching you will see that Cozumel is ranked just under Lake Placid, Florida however is a lot further down. In any case, in my head, I was pretty sure I needed to do a "real" Ironman - like Placid, or Penticton, or Whistler, Or Coeur d'Alene or Mont Tremblant, to quell the thought that I only picked the easy Ironmans. Now of course people have made comments to this effect but honestly this all stems from my own head. So last July I signed up for Placid. Yes, at that time I knew I was running Boston and NYC marathons. Yes, I think I was crazy. But here I am, 4 weeks out from Boston Marathon and 17 weeks out from Ironman Lake Placid. It is what it is and I'm doing both, I've just had to shift my goals a little bit. I always wanted to run my BQ time at Boston but that is just going to have to wait for another lifetime. I will have to take it easy in Boston because I will not have weeks to recover. In fact, I won't have any time to recover because I will be 3 weeks into my official training for Placid. I will be pushing my biking legs to the max. And, I've decided to take a lot of pressure off myself for IMLP. When I got into this crazy sport I promised it was for fun. Then I sort of got fast. And then the talk and dreams of qualifying for Kona filled my head. And then it didn't seem fun any more. And then it seemed that I was going to disappoint those closest to me. Go forward bravely and boldly. You have become a powerhouse of endurance and you have trained brilliantly, religiously and so incredibly for 3 years now! Fear not, as you battle on. Rest assured that all will be good, no matter what the outcome. Good, bad or neutral, life will go on and more races will come. So I might have bit off more than I can chew but I'm not going to back down from this challenge. So I'm back on the training program, focusing on IM training with a little marathon training in the background. I'm running the Around the Bay 30k next Sunday as my longest training run for Boston. And then I'm going to run Boston, enjoying every moment of it and not once regretting that I'm not running fast enough. And as for Lake Placid - I can only train, like I have trained in the past - I will push myself to my limits over and over in training and then on race day, I will push myself over my limits as I have done in the Ironmans before. And at the end will be the next question - Which Ironman next?